[Title in Arabic] | Dichiarazione piú copiosa della dottrina cristiana. [Rome, Propaganda Fide, 1770?]. Both works are set entirely in Arabic type. 2 works in 1 volume. 8vo (18 x 12 cm). Contemporary half sheepskin. 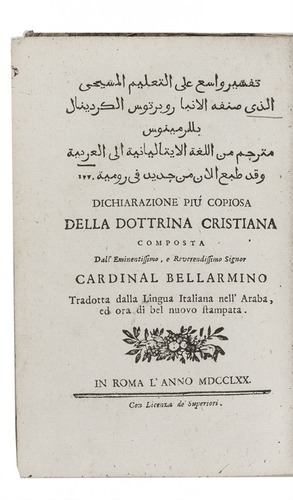 Ad 1: Third Arabic edition of the complete text of Bellarmino's immensely popular catechism. The catechism was translated into Arabic for the use of Catholic missionaries. 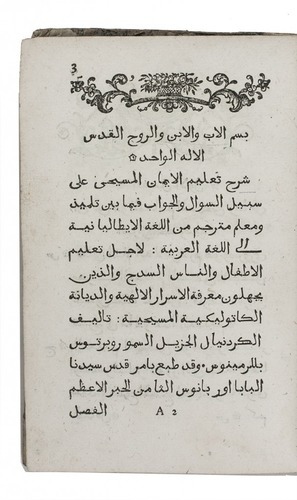 Ad 2: Rare first and only edition of Stefano Borgia's Arabic instructions for confession and communion. Borgia (1731-1804) was appointed secretary of the Propaganda Fide in 1770, the year they published the third Arabic edition of Bellarmino's catechism. He added the present instructions, apparently intending them to be bound with the catechism. With two library stamps. 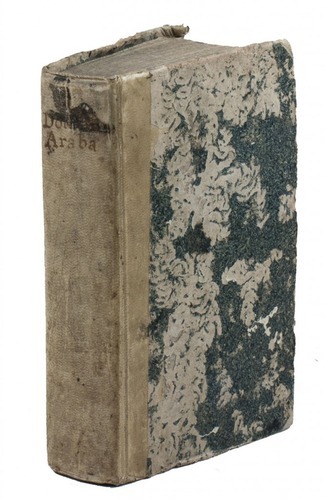 Title-page slightly dirty, wrappers slightly damaged, otherwise in very good condition and wholly untrimmed. 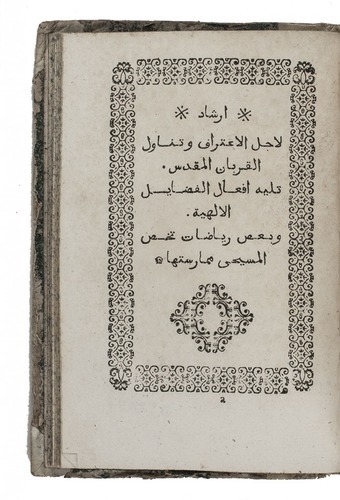 A major product of the Propaganda Fide's efforts to convert Arabic-speaking people in the 18th century, including the rare instructions for confession and communion. Ad 1: De Backer & Sommervogel I, col. 1190; ICCU (2 copies); WorldCat (5 copies); Schnurrer 303; ad 2: De Backer & Sommervogel I, col. 1190 note; KVK & WorldCat (4 copies); ICCU (2 copies); Schnurrer 303 note.